If you’re looking to gain the training necessary to start or grow your career, the BCIT Business Information Technology Management (BITMAN) diploma program gives you a broad range of skills that make you stand out in almost any industry. With cutting-edge courses that are relevant to today’s IT and business demands, BCIT gives you the leadership skills, the know-how, and the confidence for a successful career in business IT analysis and management. Given the changes in industry due to technology, cloud computing, and artificial intelligence, there is an increasing market demand for specialists with both business and IT skills, which is why the Business Information Technology Management program will help you launch an in-demand career. Economies of scale are moving computing applications and information storage solutions onto the Internet, while businesses are gathering unprecedented amounts of data. This leads to a demand for professionals that can provide business intelligence that aids in decision-making. As a business solution designer, you’ll provide the bridge between business and computing and will be able to put together custom systems using cloud-based applications. The BITMAN program will prepare you for success in a rapidly changing world. Learn more about the benefits of earning your diploma with the Program Details. Who should apply for the Business IT Management Diploma? If this sounds like you, apply today on our Program Entry page. Do you have another degree or diploma? You may be able to earn credits to advance directly to the second year of the diploma program. Find out if you’re eligible for advanced placement. With your hands-on experience and training, you’ll be prepared upon graduation to move immediately into entry-level and growth positions in technical support, business analysis, and project management in a variety of companies and industries. 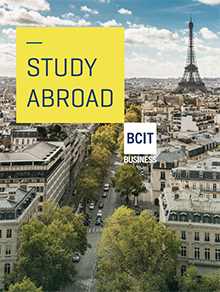 You’ll also have the option to continue with your studies to complete your Bachelor of Business Administration (BBA) degree at BCIT with full-time or part-time evening courses. Earning your diploma helps open new doors for your career, and many students begin working immediately after graduation while continuing their training to earn a bachelor’s degree to improve their skills and career prospects for the long term. Learn more about the specific opportunities available to graduates on our Graduating and Jobs page. If you think this program is for you, please begin the application process early to increase opportunities for acceptance. Check for current Business Information Technology Management program availability. Once accepted, your seat in the program will be reserved. Applicants should have one year of work experience prior to entry to this program. You must submit the Course-by-Course Self-Assessment form [PDF] with your application. In your studies at BCIT, you’ll receive instruction, practice, and practical experience in all areas of business, including marketing, accounting, HR, finance, operations, and web development to prepare you for the big-picture work of information technology management. You’ll prepare with hands-on projects developed by industry professionals, including courses like Business Information Systems, Management Science, and a business consulting project where you’ll undertake a real project for a business. Designed to give students practical application of concepts learned in major program areas by engaging in problem solving projects in business or government. Prerequisite: Successful completion of Levels 1, 2 and 3 courses (may be short one Level 3 course). The BCIT Business Information Technology Management diploma program places you in a small cohort of 20-25 students. You will attend lectures and labs for each course. In lecture, the faculty provides the content necessary to establish a foundation. Practical application follows in the lab environment. You will work directly with industry on several projects and assignments. Thanks to a generous donation from Vision33, students have access to the SAP HANA data platform to analyze and interpret large amounts of raw data. The financial support from industry leaders helps to ensure that Business Information Technology Management graduates have the skills to use the newest software programs that are commonly used in the workplace. Your courses combine introductory skills in information systems, economics, marketing and more with practical skills like leadership and organization needed to become a Business/IT professional, make strategic decisions, and create business plans. Throughout the program, you’ll develop the knowledge and experience necessary to begin or advance a successful career. Upon graduation, students may also choose to continue their studies full-time, or to begin working in their chosen field while pursing a bachelor’s degree part-time. You’ll have the option of continuing your study to earn BCIT's Bachelor of Business Administration Degree (BBA), or transfer credits to other degree programs like Royal Roads University's Bachelor of Commerce in Entrepreneurial Management Degree, Thompson Rivers University's Open Learning Bachelor of Business Administration, or Lakehead University's Bachelor of Administration Degree (BAdmin). Learn how to apply for the Direct Entry Option. A BCIT Business Consulting Project provides second year Business Information Technology Management students the opportunity to work over a 10 week period with an organization to solve an IT problem or challenge. Students work in a team of two or three to identify potential opportunities, conduct research, and recommend effective IT solutions. Students complete a comprehensive written report and present an oral presentation to the sponsoring organization outlining the student team's recommendations to improve information technology effectiveness. View a recent student project or view the complete list of past Business Consulting Projects students have completed in a wide variety of industries. You’ll learn from industry-experienced instructors who take learning beyond the textbook. Most are still active in industry and associations, ensuring they keep up with the latest trends in business and technology. Malcolm Ferrier is Program Head of the Business Information Technology Management (BITMAN) program and an instructor of Management Information Systems, Database Design, IT Project Management, and Cloud Business Development at the British Columbia Institute of Technology (BCIT). He is also the owner and founder of Ferrier Consulting, a Vancouver-based IT consulting company that has developed multiple applications for public and private organizations since 2002, ESP Analytics, a software selection web application startup, and TaskForce Automation, a project task scheduling web application startup. Malcolm has an MBA from Queen's University, a B.Sc. from the University of Alberta, and the PMP (Project Management Professional) designation from the Project Management Institute. Ron McMillan is the Program Head for the graduate certificate in Business Analytics at BCIT. He holds a Master of Science degree in Business Intelligence and Analytics from Saint Joseph’s University in Philadelphia. His extensive industry experience includes 12 years as a data analyst consultant at TELUS and TELUS Mobility and four years of custom application development at Fluor Canada. Ron has taught Business Systems, MIS, and Business Intelligence courses at BCIT since 2004. He is keenly interested in all things data and believes that data science is integral to all aspects of business. Matt Baxter has been using computers since 1976. He developed his first website in 1992 and has gone on to develop many more. When you check your timetable you are using one of the sites designed by him. He has been teaching at BCIT in the School of Business since 1986. His last professional development leave was spent at PMC Sierra, a global provider of integrated circuit chips for broadband communications. Masoud Jalili worked as an electrical engineer control systems for 10 years before entering the field of computer science in 1990. He holds a M.A.Sc from Simon Fraser University and worked in software development and teaching programming and database courses in various colleges. He joined BCIT in January 2000. Since then, in addition to teaching in related fields, he has worked in ERP software installation and support, and high end simulation and modeling software setup and curriculum design. As an example, he spent five months professional development in University of South Australia researching new trends of simulation and modeling technologies. He is currently SAP certified and is working on SAP technology courses and business intelligence. The tools which I took from BCIT have been absolutely game changing for me. Very few programs are producing graduates which have the same breadth of knowledge that the BITMAN program offers. The skills that I learned in the business side of BITMAN were what set me apart from other tech grads.